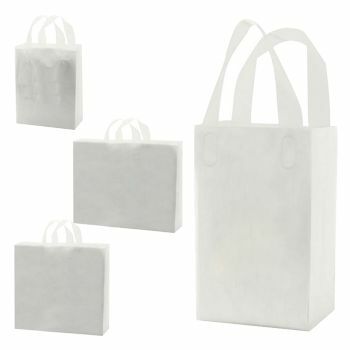 These are lightweight all-purpose plastic bags thick enough to be used for a wide variety of purposes. You won't have to worry about them tearing, and the die-cut handle makes them a snap to carry around. 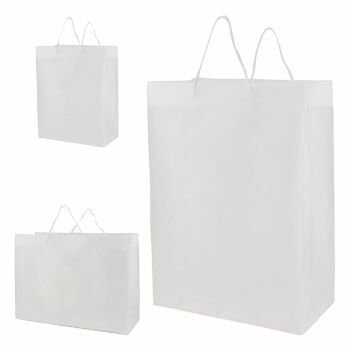 Now showing the options for "1 Color - Flexograph Print"
12 X 11" + 4"
18 X 15" + 6"
22 X 18" + 8"
When a cheap, thin plastic bag just won't do the job, these glossy white multi-purpose plastic bags with a die-cut handle are strong enough to carry even bulky items. 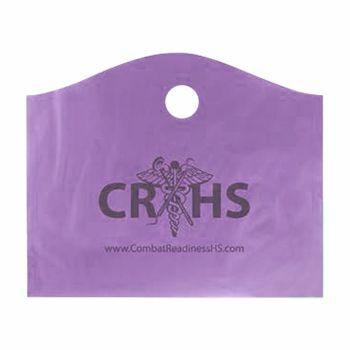 They can be used for everyday purchases or special giveaways. 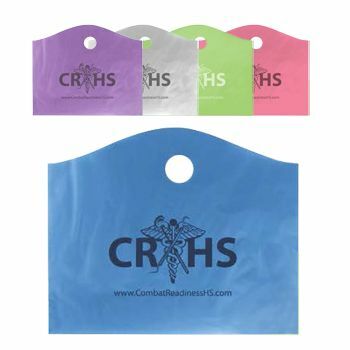 Printed with your company logo on the side, they can help to spread your brand and get your name in front of more potential customers. Customized printing services are available with every order, and a rush job is no problem. 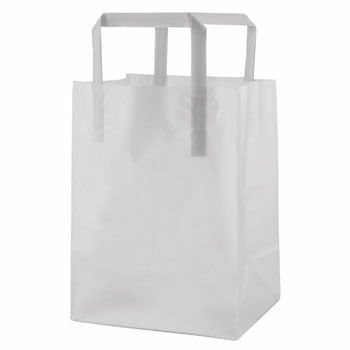 On-time production is also guaranteed, so go ahead and order a big batch of these bags today. 1. By Email: Please send your artwork to [email protected] with your Order#. 2. Upload to your account: Sign into your account. Find Manage Artwork link on the left hand menu. Browse for the desired file. Click Upload. Please send your artwork directly to your rep. 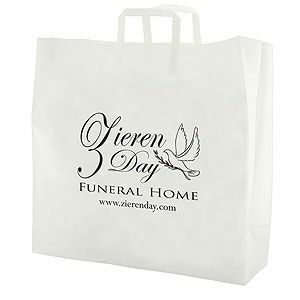 If you do not have a rep, please call 877-992-2247 to speak with a Bag Specialist. If you are ordering online, you can upload your artwork after placing your order. How do I get samples of your products? How fast can you custom print? How fast can you print? Our print and ship time differs by product. Please refer to the product page for more details. Enter your zip code and desired shipping method for specific production and delivery times. General production time can be found in the Production Schedule tab on each product page for more details. Please note that all orders require proof approval which takes approximately 1 business after submitting Vector art format. Can you guarantee on-time delivery? Normal production is 5-25 business days after all approval, depending on the product. Rush production is 1-7 business days after all approval. 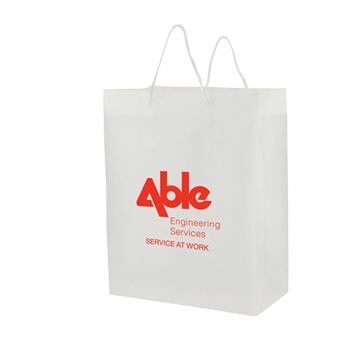 All orders required for sure-dated events must be discussed with Aplasticbag.com before a firm commitment is made, and must be indicated on the sales order. Air shipments may be required in order to meet sure-dated orders, at the expense of the customer or distributor. Non sure-dated orders are approximate and all efforts will be made to maintain these dates. Orders requiring proof approval must respond within the time designated or the order may be delayed and incur additional charges. NOTE: We cannot be responsible for delays in shipments caused by weather, system failures, or other causes outside of our control. 1. We will exchange/credit a stock product, even if you make the error, but you will be responsible for all transportation charges. 2. All exchanges and returns require a Return Merchandise Authorization (RMA) number. Exchanges and credits cannot be processed without one. 3. An RMA must be requested within 30 days of the original invoice date. Thereafter, all sales are final. 4. The returned package must be received within 15 business days of the RMA issuing date. 5. When returning products, we strongly recommend the use of a carrier that can track packages. You also assume responsibility for ensuring the returned item. 6. All items must be returned in "as new" condition in the original packaging and have all accessories, blank warranty cards, and users' manuals. 7. Please note all return conditions listed below as applicable to your return. 8. As part of our Buy with Confidence Guarantee, we do not charge any restocking fees but some restrictions may apply for sealers and machines. 9. Damaged merchandise must be reported within 5 business days, please be sure to report the damage immediately with the shipping carrier when the package is delivered so that we can process your claim. 10. If your item is defective, it needs to be reported within 10 business days, and you must have the original box. We will accept art ONLY in PC-compatible formats, created or drawn in these programs. Please, NO placed or embedded images. Convert all fonts to paths, curves, or outlines We prefer VECTOR ART created in Adobe Illustrator or EPS format. Important Note: A scanned image (e.g, .jpg, .gif, .bmp, .tiff, .psd, .pdf) or art created in a photo/paint/word program is not vector art. In addition, placing, linking, embedding, or copying these images into a drawing program does not convert them into vector art and will not meet our art requirements. We can convert them to vector for you at a minimal clean-up charge. ALL GRAPHICS MUST BE VECTOR. All multicolor artwork must be designed with PMS spot colors. No CMYK file unless it is a process print.